The three of them should have died. Liam was on board the Titanic, Maddie's flight was blown up by terrorists in 2010, and a fire was supposed to claim Sal's life in a future India. 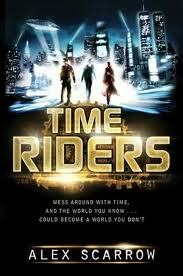 But instead, just a the last minute of their lives, they are recruited by a leader of the Time Riders, and given a chance to step outside of time. Their headquarters--a pocket of time in New York City, September 10th and 11th, 2001 (allowing them to watch what happens over and over again). Their mission--to work together to identify the workings of other time travellers, and stop them before history can be unalterably changed. With them will be "Bob," a computer brain inside a human body. Before they finish their training, they are plunged into a time catastrophe of epic proportions. A deluded genius has gotten control of a time machine, and headed back to Hitler's headquarters. He plans to take over the world himself, and make a better future than the one that actually played out (ours), but his vision is going to lead to an apocalypse. Unless the three teenagers (and Bob) can stop him. I squashed these doubts as best I could, and was rewarded with sections of interesting story (Liam and Bob's adventures back in the conquered US made for good reading), but I was never able to care all that much (I liked Bob, the not-human character, best). That being said, those who are fans of action and suspense will almost certainly (judging by the positive reviews over at Amazon) like it much more than I did. The second book in the series, Day of the Predator, involves time travel to the time of the dinosaurs, and I think I'll skip that. However, the third book, The Doomesday Code, takes them back to Sherwood Forest--I might well look for it when it comes out in the US (this is a UK series,with the fifth book coming out there in February, 2012; here's the series website). I really like the books by his brother, so I really should give him a try. I was actually able to understand this one, and as much as I normally like time travel, it is sometimes hard. It just depends on so many factors; if it doesn't click, time travel is so hard to understand. I have been fuzzy minded for the past few days, so quite possibly the fault was (in part) mine! I do feel the series have got better with each book, just thought I pitch in my thoughts to you.